Today, April 12, 2012, the head of the Republic of Kalmykia Aleksey Orlov met with President of Slovenian corporations RIKO GROUP Joza Dragan. “Buddhism in Russia” exhibition in Bhutan. A “Buddhism in Russia” exhibition has opened in Bhutan. Oil News KalmykiaNews Kalmykia. Today a meeting of the Head of the Republic of Kalmykia with Alexey Orlov vice-president of oilfield services company “Schlumberger” Denis Petrakov, reports KalmykiaNews source in the Government of the Republic of Kalmykia. During the meeting the President of the Republic of Kalmykia Alexey Orlov signed a memorandum of understanding on cooperation in the exploration of oil and gas potential of the Republic of Kalmykia and oilfield services company “Schlumberger” in the person of Vice-President Denis Petrakov. Twenty camels bound from southeast Russia to a circus in Bulgaria were stuck and became starved and dehydrated on the border between Moldova and Romania earlier this week, a popular Russian daily said. Komsomolskaya Pravda said the animals, who can theoretically last a month without food and two weeks without liquid, passed the Russian, Ukrainian, and Moldovan customs without a hitch and then problems began in Romania’s Albita. Beauty of Kalmykia KSU student Dalma Natyrova Kalmykia will be at the contest “Beauty of Russia” to be held in Moscow on November 30, 2011. November 18 in Elista, come holy relics from Sri Lanka. This spring, during a visit to Sri Lanka, the FIDE President Kirsan Ilyumzhinov, he met with President of the Democratic Socialist Republic of Sri Lanka, Mr. Mahinda Rajapaksa. During a friendly conversation the sides exchanged views on the development of economic and cultural ties, the implementation of bilateral exchanges, including through Buddhist organizations. October 20, First Deputy Prime Minister of the Republic of Kalmykia, Ilyumzhinov Vyacheslav met with the CEO of “Delimit” by Nicholaj Strashko and company representatives CHECK FARM (UK) David Summerland and Tomasz Vabich. Today, October 12, 2011, the head of the Republic of Kalmykia Alexei Orlov, met with President of Slovenian corporations RIKO GROUP Joza Dragan and the Moscow representative of the corporation Imad Khoury. Today met Prime Minister of the Republic of Kalmykia Lyudmila Ivanova with the International Finance Corporation (World Bank). During the meeting issues of cooperation between the Republic of Kalmykia and the International Finance Corporation, namely the maintenance of paved roads in the Republic of Kalmykia, and possible funding for repairs Children Republican Hospital of Kalmykia. [ En | Ru ] Today, on September 24, 2011, in Elista, the capital of Kalmykia, a ceremony of light offerings to the Buddha took place. 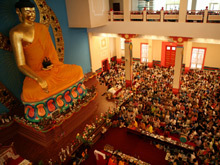 Thousands of residents and guests of Blessed Kalmykia took part in this ritual that was held at the Golden Abode of Buddha Shakyamuni. Today arrived in Elista famous American doctor, researcher, and a Buddhist monk Venerable Barry Kerzin. He will participate in the International Forum “Buddhism: Philosophy of non-violence and compassion”, which will begin in Kalmykia on September 22. This is the second visit to Kalmykia Kerzina Barry, and at a press conference at the airport, he told reporters that he was glad to meet again with residents of the republic, which in its last visit produced a big impression on him. The construction of the mandala and Buddhist rituals held in Elista, the capital of the Republic of Kalmykia (Southern Russia). September 8, 2011 in Kalmykia profit of 11 monks tantric monastery Gyudmed, and, according to administrator khurul venerable gene Lodoe arrived Buddhist monks will prepare everything for the upcoming late September large Buddhist rituals which they hold jointly with the monks of Kalmykia.